In most developing countries RTAs are the leading cause of maxillofacial injuries. These results in defects and deformities of facial region. Reconstruction of different kinds of defects or deformities is a fundamental and frequent practice in head and neck surgery. The use of different types of autogenous grafting and alloplastic materials has minimized the resultant functional and cosmetic problems associated with such defects and deformities., The use of different rib components in grafting is an established and basic modality in nasal auricular cricotracheal, cranial, and mandibular reconstruction. 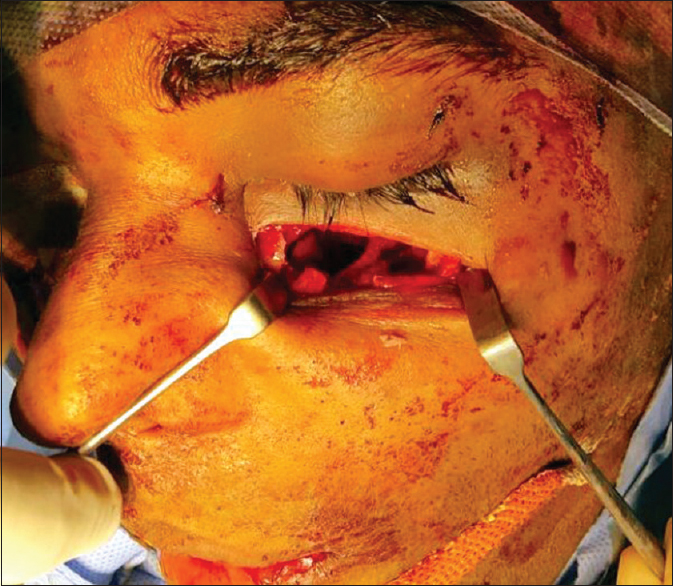 Here we present a case of infraorbital rim reconstruction with rib cartilage graft. A male patient aged 29 years reported to Department of Oral and Maxillo Facial Surgery, NIMS Hospital with alleged history RTA. Patient had a chief complaint of pain on the left side of the face. On general examination patient was found to be afebrile, conscious, oriented with Glasgow coma scale of 15. His vital signs were found to be normal (Temp. 98.6F, Pulse. 80/mint, BP. 140/90mmHg). On local examination contusions with echymosis was seen around the left eye. A 2 × 1cm lacerated wound was seen on the left infra orbital region. The region was tender on palpation. CT scan of facial bones revealed a comminuted fracture in the left infra orbital rim region. The patient was admitted for left infra orbital reconstruction with costochondral graft under G/A. Under orotracheal intubation G/A was administered. 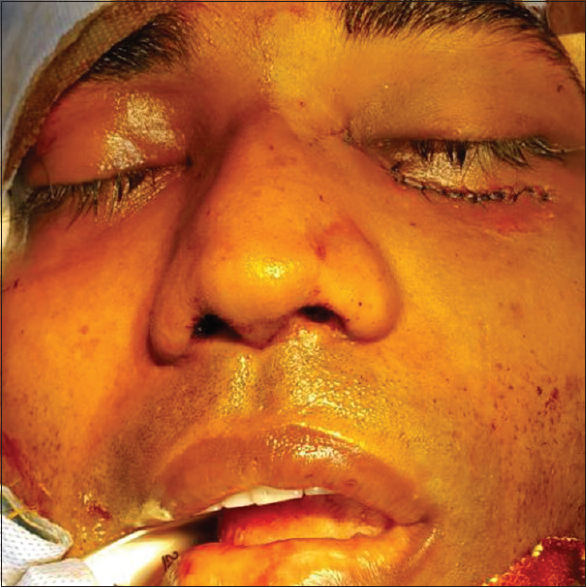 Through infra orbital incision with layer by layer dissection, fracture site was reached. Fracture segments identified and free multiple fragments were removed and defect over the infra orbital rim (leftside) was measured [Figure 1]. Ziphisternum was identified, following which 7th, 8th, 9th rib was identified by palpation. Over the 9th rib incision was made deeper dissection carried out. Sharp incision over the Perichondrium was given and reflected with special care taken during the posterior reflection in order to prevent perforation, the attachment of the rib over the rectus muscle also detached. A pure rib cartilage was harvested with rib cutter [Figure 2]. The donor site was closed in layers with 3-0 vicryl and 4-0 prolene after ensuring the pleural integrity. Rib cartilage was trimmed and contoured to the shape of the left infra orbital rim. Reconstructed segments were stabilized with 2 m.m titanium screws [Figure 3]. The inferior rectus muscle was attached to its original position. Hemostasis was achieved. Mucosal closure done using 3-0 vicryl and skin closure using 4-0 prolene [Figure 4]. Orbital Rim is a very important clinical prominence in the facial profile, both, for esthetic as well as function of the eye ball. 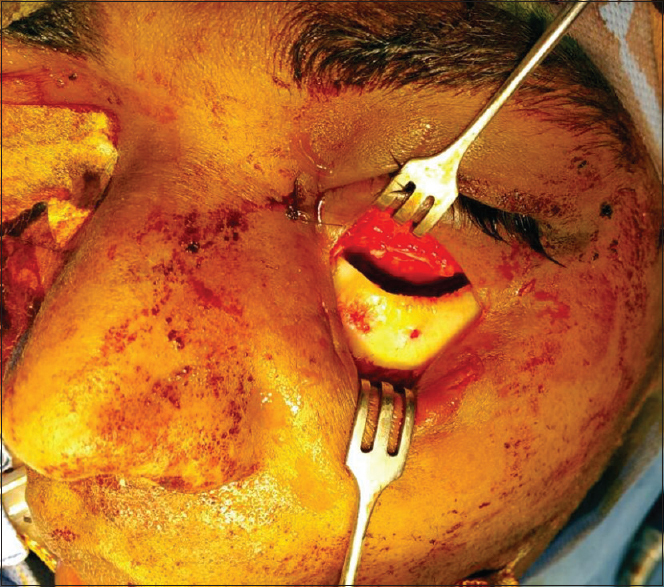 Deformity of the orbital rim will result in a drastic disfigurement of the face over the affected side. Similarly the rotatary movement of the eye ball is been facilitated by the attachment of the extra ocular muscle towards the orbital rim. Any defect involving the integrity of the margin will be disabling the function of eyeball. So it is necessary to maintain the continuity of the margin to normal or near normal form. In this case we used a rib cartilage for reconstruction of infraorbital rim, as with autologous bone, infection, extrusion, capsule formation and chronic inflammatory reactions are less prevalent than with alloplastic materials in addition to the above benefits. Cartilage is simple to harvest and shape, and provides adequate strength and support to the local tissues, which is long-lasting, without evidence of resorption. Complications of rib cartilage harvest are most commonly pain, chest wall deformity, clicking of the ribs, and donor site scar. Pleural perforation and infection are less frequent. Postoperative pain persists usually for 7 days, then resolves slowly. Most patients do not complain of significant pain after three months. 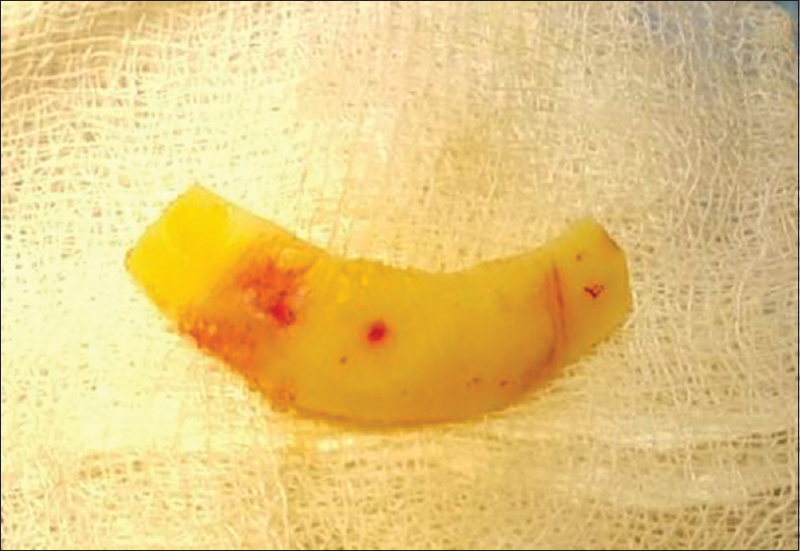 Chest wall deformity can be reduced or eliminated with reimplantation of left-over cartilage if the perichondrium is preserved during harvest. The perichondrium provides necessary support for regeneration of cartilage, or the cartilage is simply resorbed. Pneumothorax or pleural tears may be managed intraoperatively with suturing, patching, or a chest tube if necessary. In our case we did not come across with any such complication. Akama MK, Chindia ML, Macigo FG, Guthua SW. Pattern of maxillofacial and associated injuries in road traffic accidents. East Afr Med J 2007;84:287-95. Abdel-Haleem AK, Nouby R, Taghian M. The use of the rib grafts in head and neck reconstruction. Egypt J Ear Nose Throat Allied Sci 2011;12:89-98. Gurtner GC, Evans GR. Advances in head and neck reconstruction. Plast Reconstr Surg 2000;106:672-82. Daniel RK. Rhinoplasty and rib grafts: Evolving a flexible operative technique. Plast Reconstr Surg 1994;94:597-609. Mok D, Lessard L, Cordoba C, Harris PG, Nikolis A. A review of materials currently used in orbital floor reconstruction. Can J Plast Surg 2004;12:134-40. Uppal RS, Sabbagh W, Chana J, Gault DT. Donor-site morbidity after autologous costal cartilage harvest in ear reconstruction and approaches to reducing donor-site contour deformity. Plast Reconstr Surg 2008;121:1949-55.